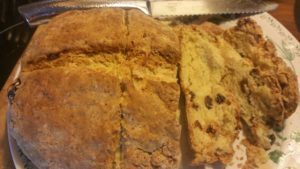 With St. Patrick’s Day just around the corner, what would the festivities be without old fashioned Irish Soda Bread? I would imagine it would not be very festive. I used to celebrate with “green beer”, but those days are long gone. I’m not much of a drinker anymore. St. Patrick’s Day is also my younger daughter’s birthday. When she first turned 21, she used to go to NYC and celebrate with her friends. She has grown out of that stage as well. So now we celebrate by taking her out for dinner or just having a special dinner at our house. Gather your ingredients and mix your dry ingredients together in a bowl. Then take your softened butter and cut it into the flour mixture until the mixture resembles fine crumbs. Add the raisins and then enough buttermilk to form a ball of dough. Then transfer the dough onto a lightly floured surface. Knead the dough about one to two minutes until smooth. Form a round loaf and cut an X into it with a knife. Place on a greased cookie sheet. I know, this picture doesn’t look like a loaf. It looks like a huge cookie. 🙂 It probably was the angle of the camera. Trust me, it will look like a loaf when done. Here it is! Sliced and ready to be served. Looks so yummy! 1 Heat oven to 375ºF. Grease cookie sheet. 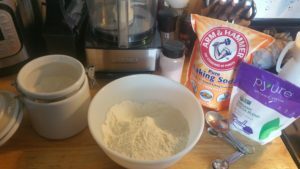 2 Cut butter into flour, sugar, baking soda, baking powder and salt in large bowl, using pastry blender or crisscrossing 2 knives, until mixture resembles fine crumbs. Stir in raisins and just enough buttermilk so dough leaves side of bowl. 3 Turn dough onto lightly floured surface. Knead 1 to 2 minutes or until smooth. 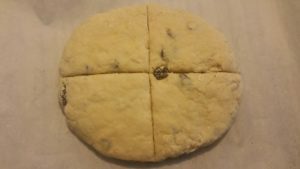 Shape into round loaf, about 6 1/2 inches in diameter. Place on cookie sheet. Cut an X shape about 1/2 inch deep through loaf with floured knife. 4 Bake 35 to 45 minutes or until golden brown. Brush with butter or margarine, softened, if desired. Don’t have buttermilk? I know I don’t always have buttermilk on hand and there are times when I can’t just run to the store. So here are a few ways you can substitute. In a 1-cup measuring cup, add 1 Tablespoon of fresh lemon juice. Top the lemon juice with with skim, low fat or whole milk. Stir and let sit for two minutes. After two minutes, your milk is both acidic and curdled. Mix 3/4 cup plain yogurt with 1/4 cup of milk. Stir it and it makes a great substitute for Buttermilk. Actually, this is what I used. I just added milk to my homemade yogurt and it worked out perfectly. You can also mix a Cup of milk with about 1 3/4 tsp. cream of tartar. To avoid lumps, mix the cream of tartar with 2 Tblsp. milk first, then add the remaining milk. The cream of tartar replaces the acid needed to sour the milk just right. Well, that’s it for now! I hope you enjoy this recipe and I wish you a very Happy St. Patrick’s Day! Next Post Milk of Magnesia – Deodorant?